Trent Armstrong of Wauseon drives into the teeth of the Evergreen defense during Friday’s NWOAL contest. The Indians got out to a fast start and never looked back, hammering the Vikings 66-43. Bryce Hudik of Evergreen handles the ball Friday versus Wauseon. 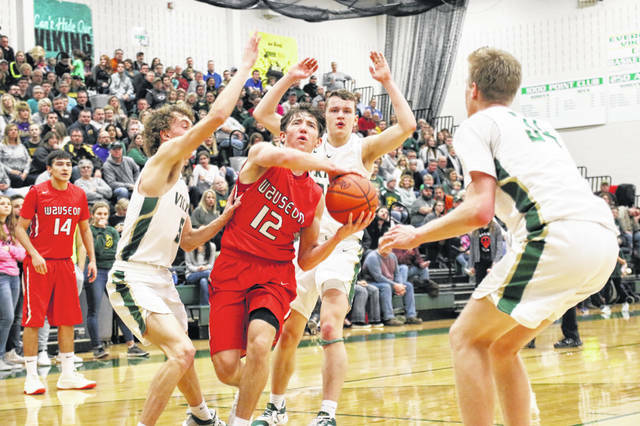 Levi Seiler of Wauseon works his way upcourt in a pivotal league game with Evergreen Friday night. He led all scorers with 21 points. Wauseon’s Trevor Rodriguez fights inside for a bucket. He added 13 points for the Indians. Yeah you remember the name. The bully on “Christmas Story” with the coonskin cap and yellow eyes that pushed Ralphie and his buddies all over Cleveland Street and beyond? 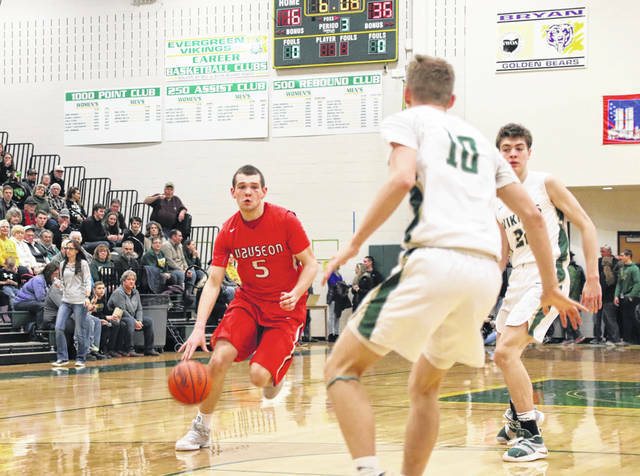 Wauseon did just that Friday night as they pushed around Evergreen all night under the glass, claiming more offensive rebounds than the Vikings had total to take a 66-43 win, keeping the Tribe in the hunt for an NWOAL title and giving Evergreen their first NWOAL loss. The Indians set the tone early as they scored not one, not two, but three putbacks in the first two and a half minutes. Trevor Rodriguez got the first two and Noah Tester added the third, giving the Indians a 6-0 lead. Chandler Lumbrezer’s back-to-back buckets got Evergreen within a score before the Vikings – who have had numerous games shooting over 50 percent this season – missed their next 16 shots from the floor. Trent Armstorng’s pair of drives to the rim, yet another stickback, this one from Levi Seiler and Rodriguez’ three-point play gave Wauseon an 18-4 lead at the quarter break. It was more Rodriguez in the second with a split at the line and another bucket inside to make it 21-4. Levi Seiler also got in tight for two more buckets, one after another offensive rebound to help the Indians extend the lead to 27-5 before settling for a 29-7 lead at the half. As frigid as Evergreen was in the first half, the Vikings came out that red-hot in the third as Lumbrezer and Bryce Hudik combined for five straight three-point bombs, along with a Lumbrezer fast break basket. However, that salvo could only get Evergreen as close as 36-22 as Tester hit two of his own from long range to keep the Vikings at bay. 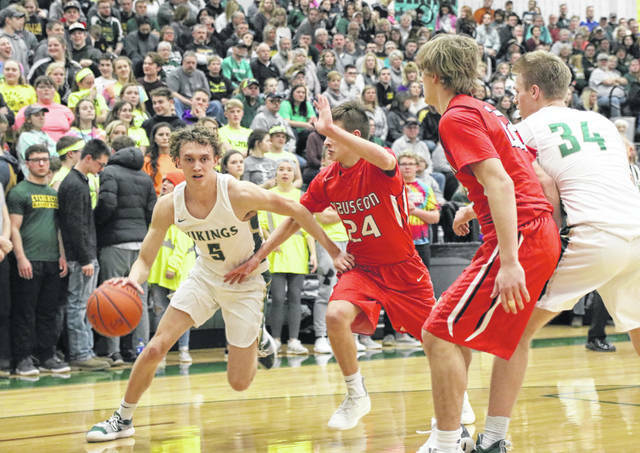 After Tester curbed the storm of Evergreen three-pointers, Sean Brock got…yep you called it..another Wauseon hoop off a rebound, before Seiler made a personal run of 10 straight Wauseon points to offset Viking triples from Lumbrezer and Jack Etue to put the Indians back in control. Seiler posted up twice for scores and got a third on a back cut to go with hitting 4 of 6 from the line from his work on the glass. The big 6’4” senior had 21 points to lead all scorers. Rodriguez added 13, many off the offensive glass as the Indians 18 offensive rebounds were more than what the Vikings had for the game. Lumbrezer was Evergreen’s only double-figure scorer with 18. Wauseon extended their record to 16-3 with a 54-41 win over Elmwood on Saturday. The Indians host Patrick Henry Friday night in an NWOAL game. 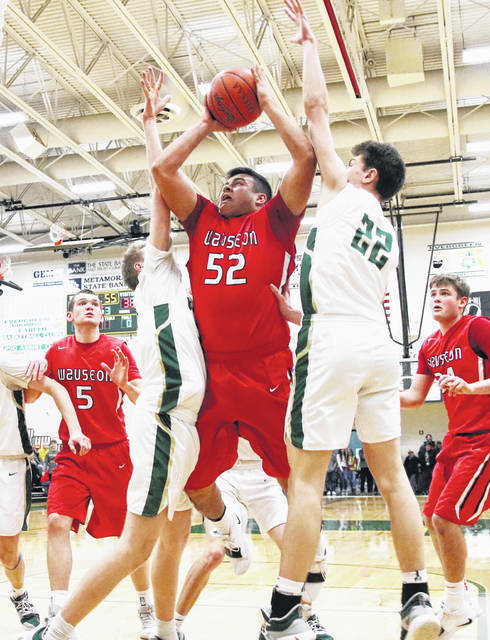 It took longer than 32 minutes but in the end, Evergreen got a pair of Mason Loeffler baskets, and hit 10 of 12 free throws in overtime to outscore Fayette 14-0 in the extra four minutes for a 62-48 win to push their record to 15-3 on the season. Evergreen got off to a fast start in the first quarter. Loeffler’s slam off a steal two minutes into the game was the first of his three first quarter baskets. Bryce Hudik added a triple and a runner in the key to help stake the Vikings to a 15-9 lead. The Eagles came back early in the second on Tanner Lemley’s three-point play and two Trey Keefer layups to take a 16-15 lead with 4:44 to go in the half. Loeffler hit six straight points on 4 of 4 from the foul line and a move inside on an out-of-bounds play to give Evergreen a 21-16 lead. After a Noah Brinegar triple brought the Eagles within two, Loeffler fed Nic Borojevich for a three-point play to boost the Evergreen lead to 24-19 at halftime. Nate Brighton’s bucket off an out-of-bounds play to start the second half gave Evergreen a 26-19 lead but Fayette hit a trio of three-pointers, one each from Brinegar, Keefer and Clayton Pheils, to bring the Eagles even at 34-34 going into the fourth. Pheils’ long range triple put Fayette up 39-37 with 6:09 left, and the Eagles led 41-40 with 3:30 left when Hudik fleeced a Fayette ball-handler and fed Chandler Lumbrezer for a go-ahead basket at 42-41. After Porter Maginn tied the game with a free throw, Borojevich nailed a triple from the left corner to give Evergreen a 45-42 lead with 2:50 left. Maginn got Fayette within 45-44 when he picked up a loose ball underneath and scored with 22.3 to go. Hudik converted both ends of a one-and-bonus at the 20 second mark, but Brinegar matched that when he threw in a flip from the middle of the key 10 seconds later. Loeffler hit the first of the bonus but missed the second with 9.1 to go, and Keefer split the defense for the game-tying score with 1.8 left. However, in overtime it was all Vikings. After Brighton converted a pair of free throws, Loeffler hit a pull up jumper then slashed to the rim from the baseline to give Evergreen a 54-48 lead at the 1:38 mark. Hudik hit 5 of 6, Loeffler 2 of 2, then Ethan Loeffler 1 for 2 to close out the Eagles and the Vikings clamped down defensively to close the game. Loeffler’s 26 points came on just 12 field goal attempts. Hudik added 16. Brighton grabbed 13 rebounds as Evergreen did a better job than the night before on the glass. Keefer and Pheils each had 15 and Brinegar 10 for the Eagles. Evergreen travels to Archbold and Pettisville this coming weekend. Fayette, now 11-8, hosts Holgate tonight, and travels to Pettisville Friday.